Developing interactive maps that incorporate text, images, video, and audio can be time-consuming and require specialized technical skills. Fortunately, at Duke we have access to Esri Story Maps, a web-based tool that helps you quickly design engaging narratives around your maps, no coding required. 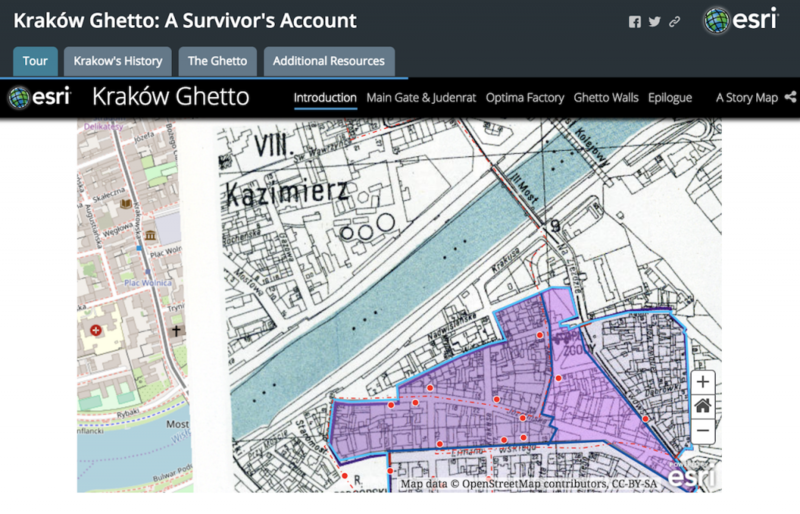 Christine Liu, a graduate student in the Department of Art, Art History & Visual Studies, created this Story Map to illustrate a journey through Kraków under Nazi occupation. If you are interested in building a Story Map, we recommend first spending some time exploring Esri’s curated gallery of stories to find inspiration and understand the platform’s capabilities. You can also review their collection of resources, which includes training videos, FAQs, and useful advice. When you are ready to get started, you can contact one of our GIS specialists (by emailing askdata@duke.edu) to schedule an appointment. We are always happy to answer questions and provide recommendations specific to your project. We also offer workshops to guide you through the process of building a basic online map, making it visually effective, and combining it with other materials to publish a Story Map. If you already have a Story Map you want to show off, please share it with us! We are assembling a gallery of stories made at Duke and would love to feature your project. Data and Visualization Services provides support for researchers at Duke in the areas of data visualization, data analysis, and data management.